Steve St. Arnaud Contracting Ltd. was hired to replace plywood and vinyl decking on a deck over living space with a 6x6 post supporting the roof above. As demolition started it was evident the structural post was hanging unsupported on the deck. The framing under the post was black rot. This led to removing the gyproc in the bedroom below which further revealed 2x6 framing and plywood over a 6 foot section completely rotted with nothing left but black mouldy mush. Due to the black mould health hazard work was stopped at this point to seek expert advice. 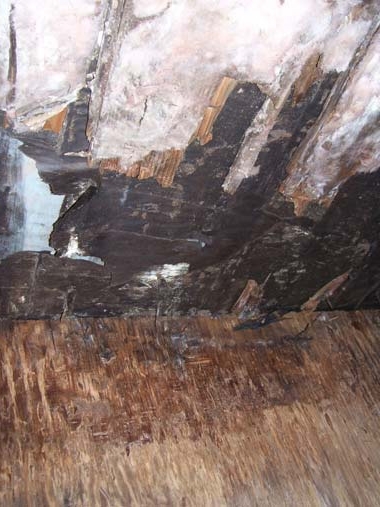 With the help of Pacific Environmental Consultation Ltd, Steve St. Arnaud Contracting Ltd.'s crew was trained in Mould Remediation and then followed the recommendations laid out in Pacific Environmental's report to correct the situation. A building permit was acquired to complete the work. The first thing we did was bring in 18 cu meters of gravel to build up the ground level above the footings. A layer of 6mil poly and 3 inch skim coat of concrete was laid on top. The 6x6 post was braced, the rotten area was contained and the floor joists were shored up. We then removed the rot and rebuilt the areas affected. Upon completion of work Pacific Environmental conducted a fungal clearance investigation and sampling which included an air quality test using a spore trap sampling . Their final report to the homeowner indicated the project was a success. The homeowner and building department considered the project a success and the owners are now enjoying their weekend home once again. Demolition revealed post structurally unsound with rotted framing and mould beneath in one corner the living space. 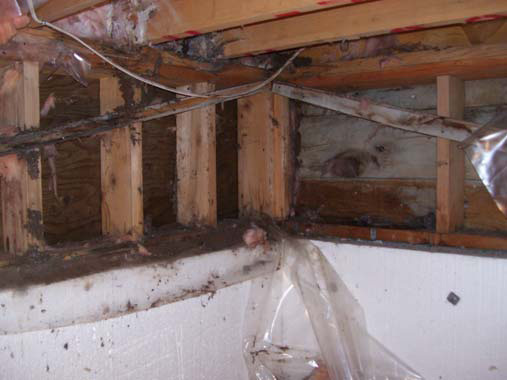 Pacific Environmental consulted and provided recommendations for remedial work. Gravel brought in to build up the ground level in the crawl space above the footings. Rot removed and floor joists & 2 x 6 wall studs replaced. Fungal clearance investigation and sampling conducted by Pacific Environmental, included in air quality test using a spore trap sampling. Building Cleared.